Damian Bursill-Hall - Flutediva - Hard work beats talent when talent doesn't work hard. Damian Bursill-Hall joined the Pittsburgh Symphony Orchestra in 1997 as acting co-principal flute and beginning with the 1998-99 season became co-principal flute. He comes to Pittsburgh from San Diego, California where he served as principal flute of the San Diego Symphony Orchestra and the San Diego Opera for more than 20 years. He has performed as principal flute with the Sante Fe Opera and from 1987-96 was both principal flute and featured soloist at the Carmel Bach Festival. His many solo appearances throughout Canada, Mexico and the United States include appearances at the Phillips Collection Gallery in Washington, D.C., the International Mozart Festival in Whistler, B.C., the Riverside Philharmonic in California, the Royal Conservatory in Toronto as well as at several National Flute Association conventions. 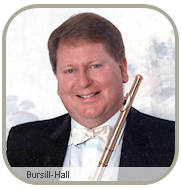 Bursill-Hall has served as acting principal flute with the Los Angeles Philharmonic and the Bournemouth (England) Symphony Orchestra. He also has performed on the soundtracks for such movies as The Usual Suspects, First Wives Club and The Mirror Has Two Faces. He has taught at colleges and universities throughout California, served as visiting professor of flute at the Indiana University School of Music during the 1993-94 year and has conducted master classes throughout North America. Damian Bursill-Hall studied with Joseph Mariano at the Eastman School of Music.